Written by CMOS Bulletin SCMO on July 7, 2018 . Posted in Climate, Oceans, Weather, What's Current. Across the globe, climate change, population growth, natural hazards and the need for long term sustainability of resource supply (including materials, energy and food) demand new approaches to Earth System Sciences. Figure 1. 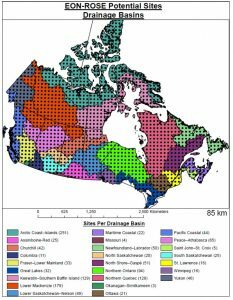 Proposed distribution of earth observation stations (black dots) for the pan-Canadian EON-ROSE network superimposed on major drainage basins (courtesy of T. James). EON-ROSE (Earth-System Observing Network – Réseau d’Observation du Système terrestrE) is an initiative representing one possible model for driving Earth System Science to support sustainable development for our planet. This pan-Canadian research collaboration, which aims to holistically examine Earth systems from the magnetosphere (the region of space that contains the earth’s magnetic field) deep into the mantle (the layer between the earth’s crust and its liquid molten core), is currently seeking additional collaborators. Groups with a focus on applications of EON-ROSE to space physics, oceanographic, atmospheric, hydrological, cryospheric and ecosystem sciences and numerical modeling including weather, Earth system, land-surface and watershed, are particularly welcome. The ultimate goal is to provide national real-time monitoring capabilities that can support improved tools for risk management, climate change adaptation strategies, ecosystem monitoring, earthquake and other disaster warning systems, and much more. EON-ROSE seeks to be a combined effort of Canadian universities; federal, provincial and territorial government agencies; industry; and international collaborators. Its overarching vision is to deploy a network of telemetered observatories to monitor solid-Earth, environmental and atmospheric processes (Figure 1). The Canadian Cordillera Array (CCArray) is the initial phase of EON-ROSE, extending across the Cordillera from the Beaufort Sea to the U.S. border (Figure 2). A key element of the proposed EON-ROSE and CCArray initiatives involves integrating oceanography, atmospheric sciences, space physics, critical zone (extending from the vegetation canopy through the land surface to the underlying aquifer) science with the solid Earth geosciences. At the first Symposium on EON-ROSE, which was held in Ottawa, February 21-23, 2018, the focus was on national applications related to (i) Solid Earth and Resources, (ii) Fluid Earth, Critical Zone and Environmental Monitoring, and (iii) Natural Hazards and Information Synthesis. This symposium started with a presentation by Daniel Lebel, the Director General of the Geological Survey of Canada, and an overview of the US EarthScope program by Jeff Freymueller, the Director of the EarthScope National Office in Fairbanks, Alaska (Figure 3). EarthScope deployed a coordinated west-to-east array of seismometers, geodetic, and other geophysical instruments across the continental US and into Alaska, enabling a wide range of work across the seismological and other geophysical sciences including imaging of discontinuities deep into the Earth’s mantle. The scale (and scope!) of EarthScope attracted broad attention, for example being identified as the top science experiment of the decade by Popular Science in January 2011. Figure 2. Proposed distribution of earth observation stations for CCArray at an 85km spacing. 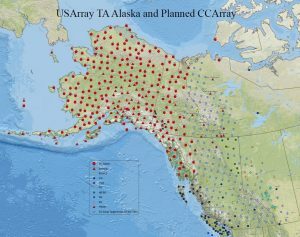 The red circles and triangles are the US TA Array stations in Alaska and northwestern Canada. The light blue circles are the ~165 proposed earth observation stations for CCArray. The various other colours and symbols are broadband seismometers from a variety of academic and federal government groups (courtesy of S. Azevedo, and R. Busby). We note the engagement of the CMOS community in this initiative. During the “Fluid Earth, Critical Zone and Environmental Monitoring” session, Paul Kushner’s (University of Toronto and CMOS President) presentation entitled “How can EON-ROSE Integrate Climate Science and Earth Science” discussed the advantage of using carefully designed and integrated observing networks capturing atmosphere/ocean and geophysical could be coordinated through EON-ROSE. Paul Myers (University of Alberta; former CMOS President) provided slides (presented by Kushner) discussing measurements and modelling of ocean circulation and freshwater at high-latitudes. 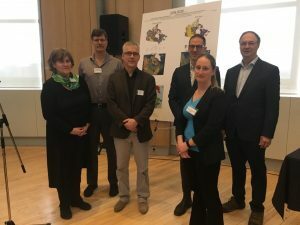 Pamela Sullivan (University of Kansas) reviewed opportunities for developing Critical Zone Observatories in Canada to enhance process understanding of the critical zone, which is the vegetation canopy-to-aquifer earth system zone that supports the terrestrial biosphere. In the subsequent discussion, Jeff Freymueller commented on how important it is to use geophysical networks to monitor environmental and geophysical processes. Calvin Klatt (Director General of the Canadian Geodetic Survey (CGS)) presented on solid and fluid Earth applications by the CGS. Thomas James (NRCan) outlined how glacial isostatic adjustment (GIA) is critical in Canada for monitoring sea level change, seismic activity and hydrological changes across Canada. Gilbert Brunet (Director, Meteorological Research Division, Meteorological Service of Canada/Environment and Climate Change Canada) also provided slides outlining potential applications to numerical weather modeling for the EON-ROSE and CCArray initiatives. Further details about these initiatives are available at www.ccarray.org and in Boggs et al. (2018). We welcome potential collaborators, questions or suggestions. Please contact any of the authors of this document and refer to the website – ccarray.org – for more information. Figure 3. Morning speakers from the EON-ROSE Symposium (February 21, 2018). From right to left: Daniel Lebel (Director General Geological Survey of Canada), Kristina Archibald (NSERC), Pascal Audet (University of Ottawa; EON-ROSE Executive), Dave Eaton (University of Calgary, EON-ROSE Director), Jeff Freymueller (University of Alaska Fairbanks, Director of EarthScope National Office), Katherine Boggs (Mount Royal University, EON-ROSE Executive). Boggs, K.J.E., Aster, R.C., Audet, P., Brunet, G., Clowes, R.M., de Groot-Hedlin, C.D., Donovan, E., Eaton, D.W., Elliott, J., Freymueller, J.T., Hedlin, M.A.H., Hyndman, R.D., James, T., Kushner, P.J., Morell, K.D., Rowe, C.D., Schutt, D.L., Sideris, M.G., Ulmi, M., Vernon, F.L., and West, N., in press. EON-ROSE and the Canadian Cordillera Array – Building Bridges to Span Earth System Science in Canada. Geoscience Canada.